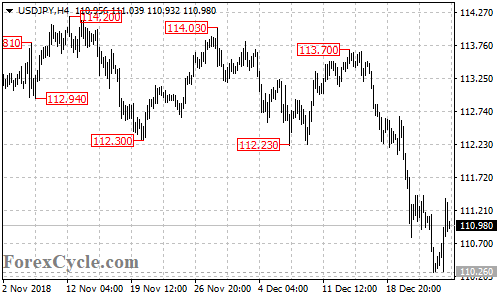 USDJPY remains in the downtrend from 113.70, the bounce from 110.26 is likely consolidation for the downtrend. Range trading between 110.26 and 111.70 would likely be seen in a couple of days. As long as 111.70 resistance holds, the downtrend could be expected to resume and a breakdown below 110.26 support could trigger further downside movement towards 109.00. Only break above 110.70 resistance could signal completion of the downtrend.